Top 7 Best Pressure Washers for 2019 Reviewed and Rated. Pressure washers are a great device to have and perfect for many tasks outside around the home, car cleaning is a popular one, as well as cleaning patios and paths. However just like a buying a hoover there is a lot of choice and a lot of different brands to buy from. We have rounded up what we think are the best pressure washers on the market in the UK and try to help match the one you should buy to your needs and budget. Once you decide to search for a good pressure washer, you can face a challenging time selecting from the variety of models available on the market. As such, we have come up with a review of the seven best pressure washers based our reviews and knowledge. We have full details about each power washer below, so keep reading to determine the one that best suits your purpose. 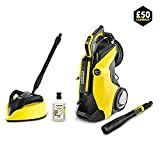 Our choice and favourite is the Karcher K4. This pressure washer is the answer to all dirty surfaces no matter their intensity. It derives its power from a water-cooled 1800 watts motor, which enables it to deliver a pressure of 130 bars and a flow rate of up to 420 litres per hour. It features a dirt blaster lance that allows adjusting of the pressure the machine delivers so that it gives a clean surface when dealing with wet or dry mud. What’s more is that the pressure delivered by this device is variable. By a simple twist of the barrel of the pressure washer, you can change the pressure produced to suit the area you are cleaning. Even better this machine delivers three pressure levels and a detergent setting which aid to making your selection much easy. Another plus of this washer is its LED light system that derives its power from two AAA batteries. This display allows you to see the pressure in utilization, thereby enabling you to ensure that you have applied the right pressure. As such, you can be sure not to damage the surfaces you are working on. The display also makes it simple for first-time users, so that they can ensure that they are on the right track. 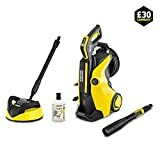 Another highlight of the Karcher K4 full control home pressure washer is its built in storage from which you can store the trigger gun and the spray lance. With this storage, therefore, you can be sure to have all accessories readily accessible. What’s more is that you can save much time while using this washer due to the plug and clean system that allows you to replace the detergent instantly. Moving this machine is easy since it features an aluminium telescopic handle and high impact wheels. We love this pressure washer and have it down as one of the best for car cleaning and a good option for your patio too. This pressure washer derives its power from an air-cooled 1400 watts motor that enables it to blast out water at 360 litres an hour. The machine is suitable for cleaning outdoor furniture, cars, among another small task. What’s more is that it allows you to manoeuvre it around with a lot of ease since it features twin wheels on the base, a telescopic handle, while it has a compact design. This pressure washer also lets you place your accessories in an easy-to-access point since it features a built-in storage from where you can put the full control lances, high-pressure gun, 5m power cable as well as the high-pressure hose. What’s more is that the Karcher K2 full control pressure washer allows you to perform tasks that require different water pressure settings. The reason behind this is that it features a full control Vario lance that features four distinct settings. These settings include the mix, soft, medium, and hard settings. The mix is the lowest setting, and it allows for mixing detergents with a suction tube. The soft, on the other hand, is ideal for patio furniture, medium for car cleaning and hard to get rid of stubborn stains. This pressure washer derives its power from a 1500 watts motor that allows it to deliver a pressure of up to 120 at a flow rate of 350 litres per hour. This machine provides excellent performance for challenging tasks such as getting rid of dirt and grime. As such, you can use it to clean patios, motorcycles, cars, and garden furniture. What’s more is that this machine is easy to move around. It has a foldable handle, as well as a sturdy wheel design. Even better, it only weighs 5.5 kgs which make it light enough to manoeuvre without much effort. Another plus of this machine is its auto-stop system which makes the pump to stop once the machine is not in use to enhance its life as well as the efficiency. This is easy to out together and comes with easy connection fittings make it simple to get up and running. The machine comes with a 3-in-1 nozzle that provides high-pressure for general cleaning; a detergent nozzle makes it easy to apply soap and a powerful 90-degree nozzle that aids in directing water into the hard to reach places. What’s more is that the washer includes a soft-bristled brush that aids in cleaning cars and windows. Our Choice for maximum power. The K7 is a beast of a power washer, it derives its power from a 2800 water-cooled watts motor. It delivers a pressure of up to 160 bars at a flow rate of 600 litres per hour. The pressure washer is easy to manoeuvre since it features large, robust wheels and a telescopic handle. It is also easy to lift as it has a handle grip at the front to the base. What’s more is that this washer features a Vario lance that helps you regulate water pressure to suit your job. It only takes a simple twist of the Vario lance barrel and the pressure changes to that which you prefer. As such you can use this machine to handle a range of projects from those with stubborn stains to those that require a fine spray. Another highlight of the Karcher K7 premium pressure washer is its LED display which is powered by two AAA batteries which are included. This display shows the setting you have applied and what it is best suited for. Also, on this display, you will find some other features which include the image of a fence, brick wood, car, and other settings such as soft, medium and heavy. All these help you to choose the duty you are on so that you deliver the appropriate pressure thereby avoid damage to your work. Other than that, this machine has a dirt blaster which helps to blast away stubborn dirt. The washer also features a plug ‘n’ clean detergent system which helps in saving time while cleaning. With its 10-meter high-pressure hose, you do not have to keep moving this machine around as it provides you with the convenience you need. This power house is certainly the best pressure washer for drives and patios and will make light work of ringing them up like new. If power is what you are after then you can’t get much better than the K7. This pressure washer gains its power from an air-cooled 1400 watt motor. It delivers up to 110 bar pressure with a flow rate of up to 440 litres per hour. This machine is easy to manoeuvre since it has a 7kg weight, wheels, and a handle. What’s more is that it allows you to have your accessories in an easy to reach place due to the onboard storage. 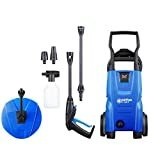 Using this pressure washer is also easy since it features click and clean connectors with quick and swivel coupling. If you like the look of the Nilfisk pressure washers then this is a popular choice and also great value for money. The machine derives its power from a water-cooled 2100 watts motor. It delivers a pressure of up to 145 bars at a water flow of 500 litres per hour. It has an 8-meter hose so that you do not have to keep moving with it while cleaning various surfaces. With this pressure machine, cleaning various surfaces is quite easy since it has a Vario lance which allows changing of the pressure levels. Also, adjusting the pressure is much easy since it only takes a simple twist of the Vario lance barrel. As such, you can remove stubborn stains in your patio as well as the easy to remove spots on your car. Karcher K7 Premium pressure washer features a dirt blaster that blasts away stubborn dirt. It also features a 3-in-1 formula that allows a high cleaning performance, care, and protection, all in one step. The LED on the power gun enables you to maintain the right and recommended pressure. This pressure washer derives its power from an air-cooled 1400 watts motor. It delivers a pressure of 110 bars and a flow rate of up to 440 litres per hour. The machine has a robust and rugged design so that it performs its desired tasks at a fast speed. What’s more is that it has an enhanced mobility since it has solid wheels while it allows you to have your accessories handy in the built-in storage. With this washer, you can perform various functions since it features a power-speed nozzle and tornado nozzle to allow you perform various duties with a lot of ease. The jet nozzle cleaner on this pressure washer helps to clean the nozzles thereby preventing blockages. With this washer, you can clean your patio with a lot of ease since you do not have to keep moving it as it features a 5-meter hose. For compact, price and power for lighter tasks the Nilfisk C110 7-5 Patio Pressure Washer is a great choice, or the Karcker K2 depending on your preference. Both a great choices and either are suitable depending on your budget. The Karcher K4 is our choice as the middle of the range and a good all rounder. Good power and water flow for a good price, ideal for most tasks from car cleaning to washing your patio. If you want more power or have a very large drive that you wish to clean then maybe consider the next one up in the heavy duty range. For power and performance either the Karcher K5 or Karcher K7 are the ones to go for depending on your budget. Both are ideal for patios, driveways, masonry and brickwork, removing stains and bringing them up like new. The pressure washers reviewed above are worth trying out. They are easy to use, and they can make you enjoy the whole process, no matter the task you have at hand. These machines allow you to adjust the pressure based on the task at hand, meaning that you do not have to worry about damaging your work surface. Our choice and best all rounder is the Karcher K4, great value, and enough power to do all tasks. So, make sure that you add at least two of these machines to your shopping list, and be sure to spend your money on the right investment. After all, since these washers have a high number of positive reviews, it is likely that they will suit your needs perfectly. The K4 does look a good all rounder for the price point compared to others, the K7 is so expensive! You’ve left out a real bargain from your review. Aldi’s own Workzone brand pressure washer. 2.2Kw, 150bar, ruggedly built with a three year warranty. £79.99 with free delivery available.